There’s a big difference between want and need that is important to understand when searching for a house to call home. A ‘need’ refers to a feature that is an absolute must in a new home. A ‘want’, by contrast, is a ‘nice-to-have’. For too many people, this distinction is lost in emotion. If buyers tell me their home needs to be at the end of a cul-de-sac, they’re the clients, so I will only search for properties at the end of a cul-de-sac. To be frank, what you need is a roof over your head, running water, heat, and because of the climate in Grand Forks and the Boundary area, air conditioning. What you want is four bedrooms, a nice private yard far from neighbours, and a pool. If you’re planning on buying a home anytime soon, allow me give you some helpful advice: Be prepared to distinguish needs from wants so that you can be confident about which homes you want to make offers on when the time comes. Follow this simple 4 step process to help distinguish wants and needs and avoid sacrificing something you really need in order to get something you want. Envision your ideal home. Does it have a huge plot of land for your dogs to run around? Or is it a nice condo overlooking the Kettle River? What is it that makes it special to you? Now, it’s time for a little dose of reality. Think about your budget, How much house can you really afford? If you’re ready to shop for homes, you should have already gotten a pre-approval from a lender. So, with that price in mind, you may need to forgo some of the wants. Unsure what’s reasonable and what’s not in your price range? This is where your local agent comes in. One of the main roles of a real estate agent is to know the area, know what homes are going for, and about how much added features — like an additional bedroom or a pool — should add to the price. As you put together the picture of your dream home, you will discover that there are certain features that you don’t want to sacrifice and for which you’re willing to pay more. Maybe it’s living within a few minutes from Christina Lake because you have a new boat that you love to take out during the summer. Maybe it’s an open kitchen or family room for entertaining guests. Or it might even be something less common, like wheelchair access for a family member. Another way to look at the want vs. need problem is that wants are things that you can add or change on your own. For example, maybe you’re a Border Bruins fan and want a home with yellow and black walls. Obviously, with a little effort, it’s easy to change these things after you move. Some people don’t even want to consider getting their hands dirty and working on their home themselves, but trust me, finding a great home at a good price is considerably easier when you’re can give a little on wants. In real estate, a value item is a feature that adds value to the property to future buyers. I strongly advise you to consider value items with more weight than things that are personal preference but add little value. Items that add value include dual-pane windows, granite countertops, high-efficiency furnace, land, nice landscaping (but don’t forget you’ll have to maintain it) and even intangibles like a beautiful view of the Grand Forks Valley. A competent real estate agent will be able to help you determine the difference between a valuable feature and personal touch.Anything too personal may lack value in terms of resale … or even subtract from it. Examples I’ve seen in Grand Forks include making the yard solely rock for less maintenance, chicken-coops (I'm guilty here as I have one in my backyard...), or bright yellow and purple walls. Keep in mind that when you go to sell, someone will want to repaint over any bright and unusual colours, and they’ll count the cost of repainting when they consider what to pay for the home. Things that add value are generally thought of as beautiful, safe or convenient by the majority of people. Things with no value are special to you for a reason that other people might not understand or want. As you prepare to buy a home, remember that no home is perfect. Whether finding a place to rent or buy, you will always end up making compromises. But with a good understanding of what’s most important to you, what you can live without and what will add value to the home, finding the right one will be easier. 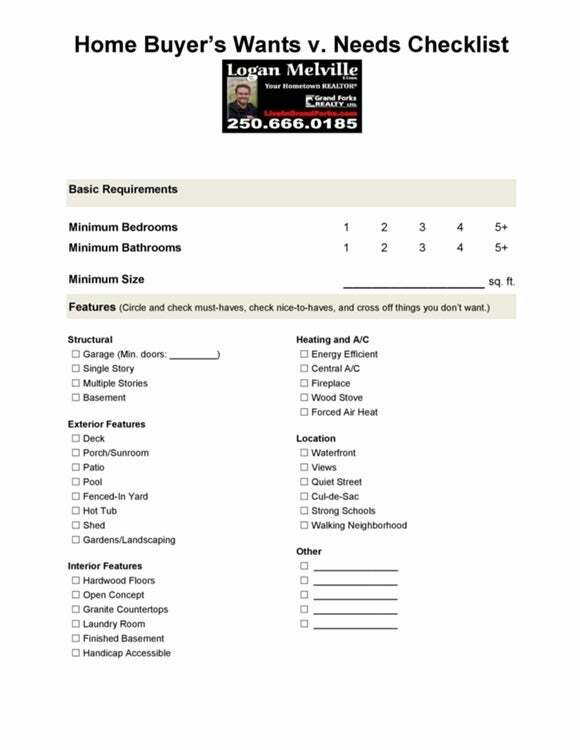 I tell my clients to create a home buying checklist of the features they want and need so I can help them determine what’s possible within their budget. You can start by using my checklist like the one below, free of charge. Just fill out contact me and I will send you the checklist, no obligation. Happy House Hunting!